In the spirit of Christmas, I'd like to join with my fellow blogging friends to share a bit of caroling this season. Thank-you, footnoteMaven, for gathering us together once again! My absolute favorite Christmas song is O Holy Night. The beautiful words and ascending phrases of the music stir my heart as I revel in the glory of Christmas. Many of my childhood Christmas Eves were spent savoring the holiness of this very special night. After the rest of the house had gone to sleep – or at least after I had gone to my own room – I would sit at my desk and look out the picture window overlooking our front yard. 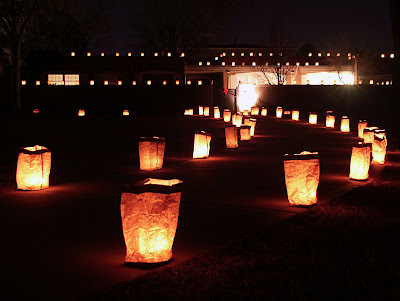 It was the tradition in my neighborhood to set out luminaria - brown paper bags weighted down with sand and illuminated by a burning candle set inside. My family and I took time each Christmas Eve afternoon to work alongside our neighbors shoveling the sand, filling the bags, and getting everything ready for sunset on this, the most joyful night of the year. I didn't know it at the time, but this tradition had originated with Spanish immigrants to the New World. It was a way that they, as Catholics, helped "light the way" for the Christ Child to visit their homes and hearts on this very special evening. Each year, after my family and I had gone to Christmas Eve Mass, we would come home to light the luminaria, share a small dinner, and head to bed in anticipation of Christmas morning. Once I was up in my room and ready for bed, I sat at my window and always watched for as long as I could, counting the candles that had gone out and savoring the glow and warmth of the peace that is Christmas Eve. A few years ago I read and smiled at the words of St. Teresa Benedicta of the Cross (Edith Stein) about Christmas Eve, “Who can sleep on this night that God became man?” I still stay up through most of the night every Christmas Eve, savoring the quiet and sometimes listening to a rendition of O Holy Night as I enjoy the peace and anticipation of this beautiful evening when Mary brought forth her firstborn Son. Christ is the Lord, O praise His name forever! Beautiful post! I remember visiting my grandparents for Christmas, when their entire community would set out luminaria curbside on every road. It was indeed an inspiring sight. What a cool post. I just saw this through Geneabloggers. I love the season of Advent.